I lay down with nothing but an unfamiliar hospital gown separating the cold hard operating table and me. Before my eyes was my mom with a blue bouffant cap smiling. She was waving a pink bear back and forth as my world became fuzzy, slow, and then black… This was not my first surgery, but it was the first time I could remember. You see, I was born with a birth defect called craniosynostosis. This is a condition where a child’s skull stops growing and leaves a child with a brain expanding but no space to go. The solution is surgery, lots of them. I had multiple skull reconstructions to progressively expand my skull. I had superior surgeons. They were the best of the best. And a host of prayer warriors stood behind me. This particular surgery was interesting. I had come to my mom complaining about a headache. “It hurts here, mommy.” What I was feeling were metal plates pressing out of my head…yeah…that is pretty unsettling. Not your average first grade experience. But I took it with pride and stride. I brought my staples in to show and tell to share with my classmates about my many operations. Yes, they resealed my head with staples, stitches, and tons of gauze wrapped around. I looked like a mummy. Or, in the words of my little brother, “You look like a bowling pin!” In many ways, during my recovery I felt like a bowling pin, a vulnerable target of social stigma. The 8-pound bowling balls came in the form of stares expressing horror, pity, and judgment. My young seven-year-old eyes were being opened to the unsettling truths of being a social outcast. And I knew this feeling all too well. It was but a gesture to my other operations. Because of my stunted skull development, I had tiny ears and lots of problems to come with them. I received my first ear tubes at age two and had 7 more sets till age 18. Ear tubes are small cylinders placed into a slit in the eardrum to reduce middle ear infections and to restore hearing loss caused by middle ear fluid. It is typical for children to have them and they will eventually fall out within 6 months. So for me to have a total of 8 sets is uncommon. I frequented the ear doctor too much and always left in tears. My grand childhood sticker collection started because of the sticker basket at the receptionist desk of my otolaryngologist. As I built up an impressive stack of stickers, the doctor’s office collected a monumentally thick file for me that spoke of the history of my social isolation. To explain more thoroughly my social isolation, I have to share with you my fear of water. Yes, water. I’m not scared of water from the tap, but rather water from the ocean, sprinkler, pool, water gun, or water balloons. What’s the difference? I knew the difference too well: proximity to ears. Having ear tubes means that you cannot get water in the ears to prevent bacteria from entering the middle ear through the tube and causing an infection. And I did not want an ear infection. I had so many growing up as a child that I feared and dreaded ear drops with a deep passion. My mom or dad would have to hold me down and put in the ear drops while I cried so that I would receive treatment. So, I adapted. I developed a subconscious reflex of pulling my head back if I got anywhere near water. My family and close friends quickly adopted this defensive reaction as well in order to protect me. I was sidelined at every pool party, beach vacation, and water balloon fight. It led to a lot of exclusion that I didn’t want or sign up for. It was, yet again, an isolator for me. My ears continued to serve as a barrier between the world and me. One time, I was given the okay for swim lessons. I was so afraid but so excited. It took so much time and patience to just get me to put my head under the water. I remember the swimming instructor working one on one with me. She would take her finger and lower it into the water and have me follow it with my head. Many times I failed, but I eventually put my head under water! Sure enough, the following week I developed a bad ear infection, which confirmed it was best for me to not get my ears wet. We tried everything from custom ear plugs to ear putty to head bands to swimming caps. Nothing worked. I felt I could never win. I would always be disconnected from the world. I wrestled with God. I asked why. I asked for healing prayer over and over again. Yet, I still ended up heartbroken, with more questions and a deeper skepticism of the Lord’s healing power. Even more dangerous, I developed this theology built around “God can certainly heal you, just not me.” This struggle carried into high school. Let’s fast forward to my junior year. This was the year I developed a chronic ear infection. I basically had a permanent ear infection that either got better or got worse. The problem moved from just pain and pressure to rapid hearing loss. I could tell. But I was trapped in silence. I sunk away from conversations I couldn’t follow or people I knew I could never hear. I developed a new way of communicating. I had to intensely listen. In conversations, I was always thinking ahead so that I could ask questions that sounded like I knew what someone had said. I got good at faking it. Until I wasn’t. I missed a lot. More than I would admit. My history classroom senior year epitomized this struggle. I sat staring at my teacher who had just asked me the same question for the second time in a row. All eyes were fixed on me. I leaned in further and asked my teacher to repeat the question one last time. He spoke softly and gently. All I heard was the kindness in his voice. I heard no words. I shrugged my shoulders and told him I didn’t know. But that wasn’t the truth. And the discomfort in the room assured me that everyone either knew I couldn’t hear him or was thinking I just didn’t want to answer the question. I left with red cheeks and watery eyes. No one noticed me though. Eventually, my friends got tired of me saying, “Pardon,” “What,” “Could you repeat that,” and “Hmm?” They grew impatient with me and frustrated until they just left me out of the conversations. I remember one specific instance when I was sitting at lunch, yet again, invisible amongst my friends. In my isolation, exclusion, and solitude, I saw a boy sitting alone. I had noticed him many times. I understood him right then. He is alone and so am I. We are surrounded by people who do not see us. But I see him. And maybe, just maybe, he will see me. I got up. It all felt like a slow motion captured seen in a movie. As I stood no one seemed to notice at first. The further I walk, the more heads at the table I could feel turning. I did not look back. I did not say a word. I did not explain myself. I simply walked toward this boy. “Hello,” I said. He looked up surprised. His eyes were scared. They are a combination of fear, surprise, and comfort. “Do you mind if I sit here?” I said. He shakes his head and I sit down. He didn’t know what to do. But I felt comfort in that, I didn’t know what I was doing either. We started talking and a conversation started rolling. His name is Linus. My name is Debbie. He’s in ninth grade and I am in twelfth. His father teaches math at the school and my mother teaches middle school English. We spoke to each other in broken sentences and strange pauses and un-intended and poorly timed interruptions. The bell rings. He stood up. I stood up. I say “See you next lunch period.” He says okay. We both leave. I walked away feeling a little different. A little less invisible. In seeing another person, I became seen. We had connected at a deep human level. He did not know the comfort he brought me. I did not know the comfort I brought him, or lack there of. How good it felt just to be in the foreground. We treasured each other. Neither of us was insignificant. We fumbled over our conversation, but we ultimately spoke life to each other. Amidst my own isolation, I could see more and more how God was using my failing physical ears to strengthen my spiritual ears. I grew in my frustration but I also grew in my dependence on God. My wrestle with God was more focused on my physical circumstances and less with the question of why. I felt an increasing awareness of how different my world was becoming. I could tell a big difference between my house environment and my public environment. My family adjusted for me. They spoke louder and turned the TV up. While they still got impatient with me when I couldn’t hear them, it was radically different from my world outside. My lack of hearing was not a source of stress but of comic relief. My younger brother excelled in the sport of scaring me. Little talent was required for this game. All one had to do was walk up behind me without me hearing you (not hard at all) and just tap me or speak loudly. I would startle frantically, punch his shoulder jokingly, and laugh. Dinner table discussions were always covered with misinterpretations, repetitions, and increasing volume. It helped that my father and older brother shared in my hearing struggles. While this light environment was refreshing, it did not solve the problem or address my inevitable insecurities. The world did not accommodate like my home did. I found myself lost in translation. One of my greatest fears was facing prayer in small group settings. Think about it, everyone lowers their heads and closes their eyes. I cannot see any expressions or gestures. All physical cues are gone. Then comes the reverential posture in tone of voice. People naturally soften their voice when speaking with God. I wanted so desperately to participate in communal prayer, to hear and join in with my fellow believers. And yet, I was left on the fringes of my own Christian community. I am making it sound like I was all alone. This is just not true. I had phenomenal mentors, family, and a few close friends who continuously supported and advocated for me. But what they could not know, what they could not share with me, was my world of silence. They did not know what it was like to have to go to class with pain shooting through your ear and still have your friends question why you are “sick.” They did not know what it was like to be in a conversation when all of a sudden you hear static in your ears that overwhelms the speaker. They did not know all of that, but they still loved me well. After high school graduation, I found myself working for my Christian dance group as a summer intern. I had been working for a few weeks preparing for our biggest event of the year, the Fourth of July Parade Worship Dance Camp. I had poured a lot of planning, excitement, and energy into this week. On the first day of camp, I got a phone call from my mom during our lunch break. Time stopped abruptly. I felt weak. I slumped down in the church hallway. And I cried. My mom informed me that my otolaryngologist, one of the best ear surgeons in his profession, had a patient drop their operation last minute and there was a free slot the next morning for an operation. Just getting an appointment with my doctor is hard because of his level of prestige. I recognized that an opportunity like this, an open surgery scheduled before college, would never come my way again. But I didn’t like how God chose now, with so little time to process and so much to give up. I was angry, sad, and scared. I was so scared. I went through my whole day preoccupied. At our staff debrief meeting, I told all the dance coaches and my boss that I would be having surgery tomorrow and they all prayed over me. That night, I drove the whole hour commute home in tears. Tears that spoke of my insecurities and my gratefulness. I arrived at home and expressed my struggle to my parents. I received a surprise visit from a friend who was there when I got the news. She had gone home after the long day at dance camp, and had pulled together a care package for me including music, scripture, candy, and a card. I was so comforted. I was checked into the hospital by 8am. My mom and a close family friend joined me in the pre-op room. I shared with them the song God had put on my heart: Oceans (Where Feet May Fail) by Hillsong. This song speaks of following God into the unknown and still trusting Him to lead you to greater things. I understood the metaphor all too well. My fear of the ocean, lack of ability to swim, and inevitable fate of drowning without God felt too close to home in this song. I understood what God was calling me to: deep trust. As I sat on the stretcher, they placed bands on my wrist to inform doctors and nurses as to who I am. One said allergies, another spoke of my surgery details, and another said “HOH.” I asked the nurse what that stood for. She said, “Hard of hearing, of course.” I was surprised. I never considered myself hard of hearing. I always viewed myself as a misfit. I didn’t fit in the hearing world but I knew I didn’t fit in the deaf community. This new identity of hard of hearing gave me a glimpse of the magnitude of my hearing issues and a hope to belong somewhere. They rolled the stretcher into the operating room. I started to sing in my heart “Oceans.” And then, my world blacked out…I woke up weak, drowsy, and disoriented. The nurse beside me asked me how I was and I gave groggy responses. She went off to get my mom and I sent my hands investigating through my head. I found my right ear was covered in a muff sort of thing. I looked at my hand. I had scraped off some dried blood that had crusted at the bottom of the earmuff. What happened? I wondered. I was swiftly transported to a wheelchair and sent to my mom’s car. She hugged me and commented on my lopsided smile. Driving home, I asked for the details of the surgery. She shared loudly with me that I had been in surgery for an hour and a half longer than the expected 2 hours due to complications. My left ear was treated by a laser, which was not as high as it should have been, so it rendered the operation in that ear longer and unfinished. The right ear had an invasive cutting behind it. My ear canal had been collapsed, so they had to perforate it to even get through. Then, they found a misplaced bone, but because the space was so tight and the risk of damaging muscles, the bone was left alone. Finally, they found that my jugular vein, which should have been encased in bone, was fused to my eardrum and was very delicately detached. Inside my right ear, they patched up the holes leftover from ear tubes that had been in there since I was two. Not only were my ears healing from surgery, I had dissolvable packing in them in addition to regular cotton. My world was especially silent. More quiet than it had ever been. I felt trapped. I got home and the pain medicine began to wear off. And that is when I stopped trying to look strong. I could not avoid the fierce and shooting pain. From waking to sleeping, I felt haunted by intense and excruciating agony. Tears were swift to fall and slow to comfort. At night I would not sleep and during the day I would not eat. And no one came. My mom was by my side, but no friends came. The only visitor I had the first week of my recovery was a family friend who delivered a touching card and flowers. I was comforted by her attention but was left wondering why no one would come visit me. In my world of silence, I faced a deep and disheartening solitude. I couldn’t hear music, movies, or TV. I couldn’t focus on reading or writing because of the pain. I couldn’t be distracted by friends because there were none to be seen, none to be felt. I describe this week as one of the hardest weeks of my life. But I also describe this week as the week that my heart entered into dialogue most intimately with God. With nothing else to hear and no one beside me, I turned to Him. He was able to know my pain better than anyone else. He was able to speak in my silence when no one else could. He was able to bring the healing I needed. Deborah Aderton has been a patient of our practice for a long time. She has a history of chronic otitis media, multiple insertions of pressure equalizing tubes and had a right tympanic membrane perforation with mucosalization with chronic otitis externa. On June 23, 2013, she underwent a right tympanoplasty, right canalplasty and left laser myringoplast. She is improving post-operatively. She has a bilateral mixed hearing loss with the right hearing loss being greater than the left. In view of hearing concerns related to her medical conditions, classroom accommodations are necessary. I read over the letter many times. I tried to pronounce all the long words and I looked up what they meant. This was the letter that I would give all of my professors. I would give the letter with an explanation of how I was still recovering and still had dissolvable packing in my ears that will go away within the next two months. I felt that this letter brought security. But I also knew that this letter of security only would be seen by my professors and not my peers. I sat in the back seat of the truck with my little brother. We were packed in like Tetris with all of my belongings. I was bringing a lot of things, a lot of baggage. Too much baggage. In that car ride, I contemplated what changes would come with a new school. I was leaving behind a world of safety nets, a mother who could sit with me in my pain, a doctor who knew my history, and family who would stick up for me and adjust for me. I was leaving behind friends who doubted and isolated. I had so much hope and so much fear. And then came the wave, the inundation of awkwardness. “Alright everyone! It is time for speed dating! Everyone get in two lines and get ready to…” says my fall orientation leader. I stand in front of a tall guy who smiles a nervous but overconfident grin back at me. “Okay, everyone, tell what urflantawifloowooanflantawiortis.” I stood there befuddled. What on earth did she just say? I gesture to the guy to answer first. He takes the cue and starts speaking of pizza and basketball. I frantically form an answer to what my favorite food and sport is. I smile and answer calmly, pasta and field hockey. We smile and do small talk as I try to hear him over the noise of all the other people talking. I laugh on the outside, but inside I am realizing this will not be one of those fun get-to-know-you kinds of games. This was going to be a fight for me to pass as a normal hearing person. Or more accurately, it was a fight for me to prove I was not a dumb blonde girl. I started to feel like that dumb blonde girl. We continued rotating for what seemed like eternity. With me meeting person after person and making up absurd responses to the unidentifiable and strange ice-breaker questions. Looking back on it, I can laugh now. It was so hard to figure out what the question was based upon answers like, “I think I would choose a monkey because if I had to climb all the way up it with, say, paws, that would be a struggle. How about you?” Yeah…I had to get really creative and innovative. And it worked, most of the time. Classes proved to be a struggle and so did everyday conversations. I would be emotionally spent most days. Communication was so exhausting and almost always one-sided. I would try to keep others talking so that I would not have to. But, as the semester unfolded I began to meet people who were less interested in the surface level things and more interested in my past. I got to speak of my hearing past to those who would listen. The more I shared, the more grateful I became for what God had brought me through. These friendships evolved to be intimate and understanding. One friend particularly stands out, Sarah. She would walk on my left side so that I could hear her better. She helped me navigate a prayer group I joined. We jokingly, but seriously, came up with phrases I could say so I wasn’t repeating prayers of another person like, “Once again, Lord, I come before you to express…” She even began to script my Christian Fellowship small group meeting so that I would know what other girls had said and what we talked about. She listened to me and asked me questions. She encouraged me to advocate for myself. Another friend, Rachel, showed me a compassionate and listening ear like I had never seen before. Just recently she told me that she had asked me several times to hang out after we first met. I apparently had not heard correctly, so she waited for me, who would never show, for two times before our first real meeting. But during our first real long conversation she just listened. Wow, it was so refreshing to be heard. To be simply heard. Our friendship unfolded and became centered around Christ, prayer, and scripture. My first semester of college was so wonderful. I left with friendships deeper than I had ever had. I left with people who knew my internal and physical struggles. And yet, I finished the semester still deeply discouraged. I still could not hear well. I sat down with my parents and had an honest conversation with them. I explained that my hearing had not improved since the surgery. They swiftly encouraged me to have my hearing tested so that I could receive hearing aids. I laughed and resisted. If I needed them, my doctor would surely have told me by now. And besides, I could still hear. I walked into Costco’s Hearing Center nervously led by my parents. I was the only young girl in the Center. The audiologist looked at the name on the sign in sheet and immediately went to my mother to shake her hand. My mom then redirected her to me. We both chuckled and she led both my parents and me into the sound booth. I had completed hearing tests so many times before. I went through the regular discouraging motions of clicking when I heard the occasional beep and repeating the words spoken to me. My parents watched in anticipation. I just felt regret. Was that really a beep? Is this silence too long? What would this prove? That I couldn’t hear? I already knew that. After the test, the audiologist called her coworker into the booth. They both looked at my ear through the otoscope. They both spoke in amazement. I felt like a strange specimen. They usually worked with old people and normal ear structures. I was different in every way. They both looked at my test results and then began to relay the extent of my hearing loss to me. Turns out that I had conductive hearing loss. At the most basic level, this means that sound is not conducted efficiently through my outer ear canal to my eardrums which reduces the sound level I hear at. With this information, I already knew more about my hearing loss than I had ever before. Then, my audiologist printed out my hearing test and began to explain to me how the degree of hearing loss is measured. It is measured in levels named mild, moderate, severe, and profound. The results were so validating. I felt more understood by my parents and I knew from here on I would understand more about myself. My left ear had moderate hearing loss and my right ear had borderline severe hearing loss. I breathed in deeply. I was so relieved. The unspoken and silent suffering now had a name. I finally fit into a category: hard of hearing. Next came a weird and strange experience. They calibrated two different brands of demo hearing aids for me to try on and test out. She showed me how to wear them, handed me a remote to control the volume, and sent me outside the sound proof refuge with my parents to walk around. I was overwhelmed, amazed, and speechless. Everything sounded scratchy and electronic. My parents and I laughed and had fun. They whispered behind me and I could hear. And it clicked. It clicked in my head just how much I was missing. It clicked in my head how much I could gain for advocating for my needs. It clicked in my head that this would open my world. A week later, I sat in the train on my way to pick up my new hearing aids. I decided to us this time to express my world without hearing aids in poetry. I did not want to forget. It had always been so hard to explain what my world was like in terminology that people would understand. But this time, I described my world in terms of sight. I called my ears colorblind. On my journey home, I was able to speak of my world so clearly as I have never before been able to. Why? Because I spoke of my world with hope. My audiologist pulled out my custom hearing aids. She sat me down and showed me how they worked, how to clean them, replace the domes, charge the batteries, adjust the volumes and different settings, and how to use the remote. She ran a few last tests and a few new calibrations to make the adjustments final. I put them on. All was good. All felt normal. We thanked the audiologist and stepped outside of the soundproof room to fill out the final paperwork and pay. It felt like someone had smacked me in the face. I was completely overwhelmed. My head began ringing and beating. I could not focus on anything. There were too many sounds. I heard the intercom system. I heard the carts being pushed, the children screaming, the feet walking, the pen writing. Ouch! Everything was loud and everything was crystal clear. I could even hear my hair brushing up against the microphones of my hearing aids. It was a total inundation to noise like I had never known before. And my voice. It was so weird to hear my voice in my head and then through my hearing aids at the same time. It was like hearing myself talking into a microphone. The car ride home was just as confusing. I could not tell where the voices were coming from. I heard the car on the road, the radio, the blinker, the people talking, the people talking to me…oh wait! “I’m sorry, what did you say?” Wow, I never thought those words would come out of my mouth again. I thought these hearing aids would solve all my problems not create new ones. I had to figure out how to converse again. I had to relearn the volume of my own voice and I had to learn how to selectively listen. I had to relearn which direction sounds came from. All these new problems began to sink as my new sight began to rise. I saw that my world had become so much more colorful. All around me was a new vibrancy, clarity, and beauty that had not been there before. I celebrated this new world! I laughed and cried. I was overjoyed. On my train ride back, I finished my poem and titled it “Hearing In Color.” God revealed to me the beauty of my color blind past and His delight to give me this unfamiliar world of color. All my close friends wanted to see. I showed people eagerly and joyfully. I listened eagerly in class and actually caught every word. I spoke softer and understood clearer! And, ahh, I could pray in a group setting again. I rejoiced in this one gain particularly. Then, I began to notice a different treatment for those who saw my new hearing aids. For some it was apologies, for others it was a change in tone of voice. For others, it was a look of confusion and curiosity when I changed my batteries in the middle of lecture if they died. I did not know how to express this new gift from God. Do I post it on Facebook? Do I send out an email? Do I stay silent? I wasn’t sure. I decided to not use social media but rather wait for conversations to come up. I didn’t want my lifetime struggle and God’s precious gift to be scrolled through passively by bored and insecure teenagers looking for something exciting. I also wasn’t sure what the backlash would be? Positive or negative? Inquiry or avoidance? Joy or sorrow? So I waited. I marveled. I enjoyed. I reached a new level of gratitude. I was overwhelmed with joy. But in my waiting, few actually asked the questions I longed to be asked. “Debbie, how has your hearing affected your faith?” or “Debbie, what do you miss about your world of hearing aids?” or “Debbie, what do we take for granted having normal ears?” But I was too cowardly and conservative to volunteer this information, so I remained silent. Fast-forward a year. In that whole year, I grew more in my dependence on God. I saw his beautiful world. I felt free. Slowly I became more bold about my past. I decided on a whim to read “Hearing In Color” at a college coffee house open mic night. Then, on the first anniversary of when I received hearing aids, I decided to post the poem on Facebook. With the post, I extended an invitation to anyone who wanted to know the full story. This was perfect. I had a whole year to process God’s faithfulness. I had thoughts to share that were refined and mature. And only those who took the time to read the poem and made the effort to contact me would know the full story behind what had happened. During the week, I talked to my friends and my mentor about the concept of healing prayer. It just so happened that my Christian Fellowship was going to have a worship evening with healing prayer that weekend. I started getting nervous, skeptical, and totally fearful. I did not want to disappoint people. I did not want to disappoint myself. I did not want to have false hope and I did not want to revisit all the many heartache I have felt over the years praying for my ears. But somehow, God convinced me to tell my friends that I was okay with being prayed over. I could not help but feel God was challenging me to approach the Lord not as my wounder, but as my healer. There was something deeper to these verses than healing too. There was a promise of new life, a promise of restoration. This kind of new life directly parallels that of Jesus. Before Jesus resurrected, he was dead. He was suffering. But he triumphantly experienced life like no other man had experienced before. This kind of experience encourages a response of pressing on to know the Lord more fully. It asks that we come to God expectantly, because no matter what He will show up. So, I entered the evening with a lot of baggage and yet, somehow I also had an open heart. The first half of the evening I just worshiped. I prayed. I journaled. Then, one of my friends came up to me, took my hand, and led me upstairs. I sat down with a few of my closest friends and we started praying over my friend Sarah. As we were praying, another friend, Kevin, came over to pray over Sarah and me. As he prayed, I began to cry. This was not unusual for me during healing prayer. I came in knowing that I would shed some tears. I was crying for all the times I had prayed for healing and not received it. I prayed because it was my heart’s desire to know this healing. I cried. Kevin’s prayer was beautiful and passionate. But it quickly moved from healing to God’s overwhelming love for Sarah and I. He kept speaking of the Lord’s love for us. My heart sunk so deep as he finished. I quickly turned to my friend Rachel and began to pray over her. As I was praying, Kevin was trying to get my attention. It took a little while, but he finally did. He explained something to me. He said to me that while he was praying for me, his left ear went deaf. When he finished praying, he felt a release and he could hear again. I froze. My heart pounded. “Debbie, take out your left hearing aid,” he said. I felt weak. If I take out my hearing aid, will I disappoint them? Will I disappoint me? Will I disappoint God? My hand slowly went up to my left ear. I took out my left hearing aid. Sound. Sound all around. I could hear better with it out than with it in. In the split second I had to process everything I had no other reaction other than to cry. I wept. On my knees, I wept with my hands over my face. My closest friends sat surrounding me, laughing and weeping and praising God I wanted to check if it was real, but I could not even stop crying. I don’t know how long I was there. But I know that when I stood up, I had my hearing aid clenched in my hand. Rachel took it and put it in her glasses case. I went downstairs where the worshiping was still going on. I could not go five steps without people running up and hugging me asking what had happened. I excitedly fumbled over my life story and quickly told people what had just happened. So many people kept coming up to me. I started to feel overwhelmed. I went to the back of the room and just started dancing. Then Rachel grabbed my hand and we ran outside. We shouted “Hallelujah!” We laughed. We cried some more. I was shaking. Could this be real? This is something I knew I could not fake. But how could it be real? We went back inside and I continued to share my story over and over. I shared the story of my ears more within those few hours than I had in my whole lifetime put together. Wow. I couldn’t breathe. I couldn’t believe. How could this be true? Why now? Why here? Why just my left ear? As I shared, I started to realize that both ears represented God’s faithfulness. My eyes, my sight, are between God’s faithfulness. Both ears reminded me of God’s generous healing. Both ears brought me into a different world. With my right I fit into the hard of hearing world and with my left I fit into the hearing world. One spoke of me God’s provision and the other spoke of God’s provision. I was overwhelmed. Everyone decided to go out to get milkshakes to celebrate. I nervously drove still shaking from the whole experience. I parked the car and everyone got out. I told them I would meet them inside. Then, I sat in the car and cried. I pulled out my phone and dialed my mom’s phone number. “Hi Mom!” I stumble over the story between nervous laughs and joyful tears. She laughs and cries. I laugh and cry. We recount all the things I had been through and all the years of struggle and all the countless prayers. I hang up the phone and text my dad, who is on a business trip, to call my mom to hear the whole story. My mom and dad had been praying my whole lifetime for this. I walk into the restaurant and am greeted by so many eager and curious eyes. In a few hours, I had gone from being just another member of the fellowship to the center of attention. I did not know how to process this. How could I? I had always been prayed over for healing, but no one actually told me what to do when you are healed. I barely drank my milkshake as I told the story over and over again. And then, I remembered Hosea 6. I pulled out my Bible and started to read that verse to myself and then to my friends. Wow! Can you believe our God? The words came to life. I understood what both sides of the equation meant. “He has torn us to pieces, but he will heal us.” A new word stood out to me: will. God will heal us; in his own timing and in his chosen place, he will heal us. I could see now. I had rich community all around me to celebrate and process. I was old enough to know what healing meant and be able to speak articulately about it. God had already put me in a position in my fellowship to be heard by those around me. I understood a little more why he chose now. People’s faith increased rapidly. We drove home and I got to my room. On our way, we passed an accident. We prayed over the accident and kept going, thinking nothing of it. My three roommates, yes three, all crowded around me and started excitedly talking to me, testing my hearing, and asking for the story again. In all the flurry of everything, I started to sink. I started to sink into doubt. What did it mean that I had cried, “healing?” I looked down at my phone. I had tons of texts, Facebook messages, and posts all about my healing. I wasn’t ready. God, why did you choose me? Did you even choose me or was I making this up? God chose the one person in the room who did not believe in his healing power to be a vessel. I journaled frantically in my bed. “Goodnight, Debbie!” I said goodnight to my roommates not thinking about it only to hear scurrying and I look up. There are all my roommates standing fascinated by me. They were smiling and giggling. They shared with me that every night they said goodnight to each other, and I never responded because I could never hear them with my hearing aids out. I shivered. Could this really be true? I had several confirmations that it could be. Kevin said he went deaf in his left ear, not right. I almost felt like this gave him authority to pray healing over my ear. I took out my left hearing aid and could hear better. I had gone the whole night without my hearing aid and had not struggled like I would have without it. And now this. My roommates sharing with me of a change. But I was still missing some things. But you never worry do you? I stop and turn around. My roommate screams. I jump and start to laugh. “What are you doing in the attic closet? !” We laugh as I explain that I just needed to be alone. She giggles and closes the door. I sit in God’s presence again. How can this be true God? I wrap up my time with the Lord and step back into my room. I pick up my phone and I start scrolling through all my messages, the Facebook posts, and my texts. Kevin’s Facebook post on my healing had already reached 394 likes. People are asking for the story. I kept scrolling. One jumps out at me. I gasp. Apparently, the car accident we passed last night was Kevin. Kevin had gotten T-boned last night on the passenger’s side. Miraculously, he had no one in the car, which honestly never happens. He was unharmed. Shaken, but unharmed. I knew in my gut that this was yet again the Lord showing me that my healing was real. This was spiritual warfare. The Lord could have very well allowed last night to be a day that he gave life and a day that he took away life. The devil wanted to dampen the joy of the healing. His doubts had already flooded my mind. And yet, the coolest thing was, I had prayed over the accident last night, not knowing it was Kevin. It was God using his children to seal and embolden each other right in front of Satan. I had shivers down my spine. I call my parents and we talked for a long time. I tell them everything I am going through. We set up an appointment the next week for me to visit the closest audiologist. They advised me to call a close family friend who is a pastor. I called this family friend who coached me through my doubts, spoke to me of the concepts of deliverance and healing. She challenged me to rebuke fear, distrust, and doubt in the name of Jesus and to give no grounds to the enemy. This was easier received than done. She clarified that Jesus always wants our faith to increase. He will give us situations like Peter walking on water and like Thomas in which our faith can be grown. Both Peter and Thomas didn’t have complete faith. But eventually, they knew the God of miracles to be true from personal experience. The week leading up to my audiologist appointment was so surreal. I had random people stopping me and asking me what happened on the street. I had friends sharing my story and I had strangers sharing my story. I met up with a lot of people and they all asked similar questions that hit right at my fragile new faith. God, again and again, asked me to speak of what I knew to be true even in my unbelief. “Don’t waste this opportunity to glorify me.” He would tell me. I continued to go to classes and I continued to hear almost everything. Almost. But honestly, I just wanted to know. My mom cut me off. “Oh, why not?” She said. She proceeded to tell him that I had been prayed over for healing prayer and that we wanted to test my left ear specifically. She was more bold than I. The man looked puzzled and slightly judgmental. He did the tests and looked at the results for a little bit. Then we printed out the new results. He drew circles on the chart showing where I had increased. He sounded unimpressed but did say that there had been increase in my left ear. He recalibrated my hearing aids so that they were fixed to the new levels and then sent me on my way. He told me it was important for me to wear my hearing aids because they were therapeutic to my hearing. My parents and I went out to eat for lunch afterwards. I sat down confused and disappointed. What did all this mean? I knew it meant that God did not completely restore my hearing. This was enough to increase my faith. He had increased my hearing. But by how much had it increased? It didn’t look like a lot on the chart. My mom was looking up facts on her phone while my dad was creating a layover chart and I was looking at my Bible for some wisdom that was beyond me. My parents and I processed and concluded that we would do our own research to learn the implications of the increased hearing. They drove me back and we ran into my Christian Fellowship pastor. We shared the graphs and news with him and he shared excitement. I felt my faith had increased, and I was glad to say that I was not faking it. It was not full restoration, but it was something. However, I still wanted facts. So, then came all the research. Here is a layover of my left ear hearing tests. The blue is before and the green is after. It turns out my hearing had increased at all areas but one. 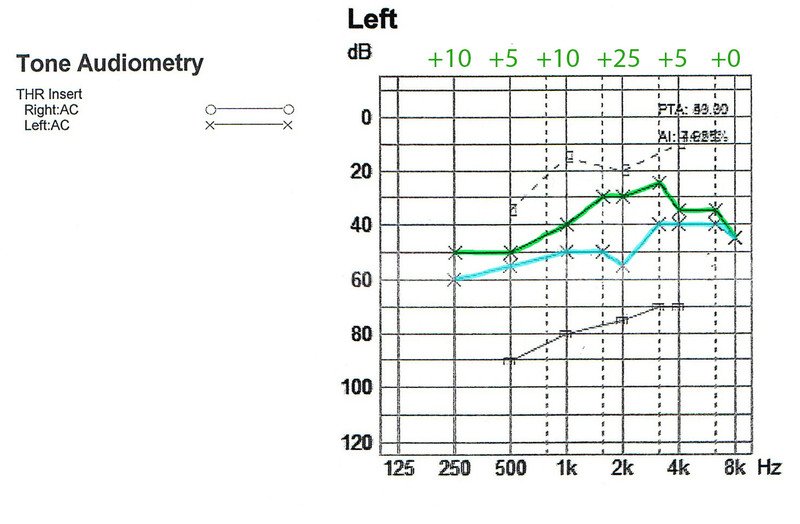 The largest increase of 25 dB was at 2,000 Hz, which is the frequency where people hear and distinguish voices. This means that I was now hearing voices six times louder! My parents and I couldn’t help but laugh. The audiologist knew that I was hearing six times louder. He probably wanted an explanation beyond that of healing prayer. He probably didn’t want to amp up the excitement. Little did he know, he had just built suspense! I praised God and worshiped him. I felt like Thomas. I needed to touch the results of my Healer before I could believe. But my, did I believe now! I just wish I had this kind of faith from the beginning. God had to open my ears to open my mouth. I realized that I had shared my testimony and God’s goodness with so many people. My faith had increased. Their faith had increased. Since my healing, I have shared my testimony in front of my whole Christian Fellowship (around 500 people), countless friends, strangers, and acquaintances, and I even got to share it in Spain! Some of my doubts are still there. Some of my questions still remain unanswered. Some of my hurts and insecurities persist. But I rest safely in the fact that I know a Healer who is real. And, I am excited to see what he does next. My healing was not the beginning or the end of my testimony. It was and is but a taste of my good God. So, let me introduce you to my God; the one who is faithful; the one who provides; the one who listens; the one who heals. I beckon you to tune your ears to Him. Come to Him with gratitude and expectation that He will do something new. He is always healing, always delivering, always renewing. I hope that my story turns you not to me, but to my God. Stand in awe of Him. Be amazed at who He is and what He can do. Read these verses with new eyes, new ears, and bigger faith.